When you are creating a SharePoint Add-in, custom actions let you interact with the lists and the ribbon in the host web. A custom action deploys to the host web when end users install your add-in. Custom actions can open a remote webpage and pass information through the query string. Two types of custom actions are available for add-ins: Ribbon and Menu Item. You need a development environment as explained in Get started creating provider-hosted SharePoint Add-ins. The following table lists useful articles that can help you understand the concepts and steps that are involved in a custom action scenario. SharePoint Add-ins Learn about the new add-in model in SharePoint that enables you to create add-ins, which are small, easy-to-use solutions for end users. UX design for SharePoint Add-ins Learn about the user experience (UX) options that you have when you are building SharePoint Add-ins. Create the SharePoint Add-in and remote web projects. Add an add-in webpage for the custom actions. Add a Menu Item custom action to the SharePoint Add-in project. 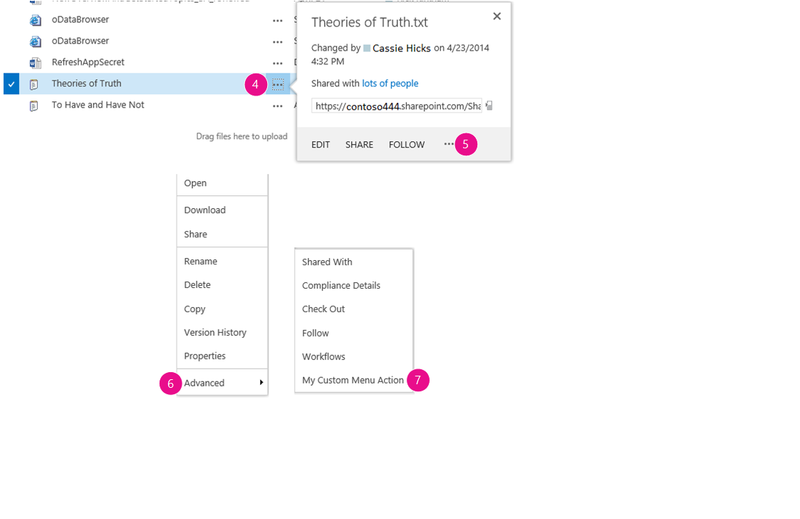 Add a Ribbon custom action to the SharePoint Add-in project. Set the add-in start page to the host web home page. Build and run the solution. Create the provider-hosted SharePoint Add-in as explained in Get started creating provider-hosted SharePoint Add-ins, and name it CustomActionsApp. After the Visual Studio solution has been created, right-click the web application project (not the SharePoint Add-in project) and add a new Web Form by selecting Add > New Item > Web > Web Form. Name the form CustomActionTarget.aspx. Provides a placeholder for the query string parameters. Extracts the parameters from the query string. Renders the parameters in the placeholder. The ItemURL and ItemID tokens only get passed when there is an item selected. In a production quality SharePoint Add-in, your code needs to handle situations where no item is selected. In this example, the code alerts the user that no item has been selected. // Extracts the parameters from the query string. // Alert the user when no item has been selected. // Render parameters in the placeholder. Right-click the SharePoint Add-in project, and select Add > New Item > Office/SharePoint > Menu Item Custom Action. Keep the default name, and then select Add. Where do you want to expose the custom action? Select Host Web. Where is the custom action scoped to? Select List Template. Which particular item is the custom action scoped to? Select Document Library. What is the text on the menu item? Enter My Custom Action. Where does the custom action navigate to? Select the CustomActionAppWeb\CustomActionTarget.aspx page. associated web project, use ~appWebUrl if page is in the add-in project. In this example, the remote webpage opens in a full window when the user selects the custom action from the menu. Custom menu actions can also open a remote webpage in a dialog box by using the HostWebDialog attribute. For more information, see SharePoint-Add-in-Localization. Right-click the SharePoint Add-in project, and select Add > New Item > Office/SharePoint > Ribbon Custom Action. Where is the control located? Select Ribbon.Documents.Manage. What is the text on the menu item? Enter My Custom Ribbon Button. Ribbon custom actions use SelectedListId and SelectedItemId. ListId and ItemId work only with menu item custom actions. The continuing sample SharePoint Add-in doesn't have any add-in web, and its remote web application exists only to host the form. So the start page of the add-in should be set to the home page of the host web. To begin, select the SharePoint Add-in project (not the web application project) in Solution Explorer, and copy the value of the Site URL property, including the protocol (for example https://contoso.sharepoint.com) into the clipboard. Open the add-in manifest, and then paste the URL into the Start Page box. Optionally, you can delete the Default.aspx page from the web application project, because it is not used in the SharePoint Add-in. Select the Trust It button. The default page of your developer site opens. Navigate to any document library in the host web. Select the callout button ( ...) for any document. The callout opens. Select the callout button ( ...) on the callout. Select the Back button on your browser to return to the library. Open the File tab on the ribbon. Select My Custom Ribbon Button. You see the same remote webpage. Visual Studio does not open the browser after you select the F5 key. Set the SharePoint Add-in project as the startup project. The tokens in the URL are not resolved after you select the F5 key in Visual Studio. Go to the Site Contents page in the host web, and select the icon for your add-in.